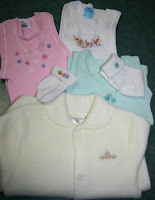 With the arrival of little Lexie, last night I was busy, busy, busy ... stitching, stitching, stitching. Decided that I didn't want to overdose her on floral designs, so tried something a little funkier and more modern by stitching blanket stitch circles on the vests and matching socks. Couldn't resist a cute bunny rabbit on the jumpsuit though .... They were received well by DS & DDIL, so it was worth the effort. 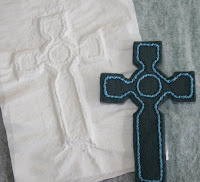 I've also been experimenting (a new thing for me) to create textures, and started by creating a Celtic cross by fusing 3 layers of felt together and then stitching the raised design with whipped backstitch using a Perle 8 thread. 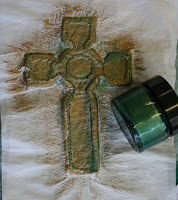 I then had this great idea to use water soluble paper to create a mould (concept only half thought out here). I used three layers of paper ... started with four, but learnt within the first 5 minutes that you have to be very careful how much water you add to your paper otherwise it just disappears altogether. So eventually logic kicked in and I used a mist sprayer to dampen the paper, then pressed it over the felt mould, and held it in place with a weighted plate until it dried. The result was pleasing, then it dawned on me that I couldn't paint it because the paints would make it dissolve (Duh!) ... so instead I rubbed treasure gold and green wax over it to create an aged effect. Overall, I'm pleased with it .... what I'll do with it is another thing.